A New Zealand Sunday newspaper today called on France to strip former spy Christine Cabon and other French saboteurs who bombed the Rainbow Warrior in Auckland Harbour on 10 July 1985 of their Legion of Honour medals. 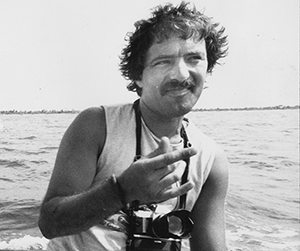 The Sunday Star-Times, which devoted the front page and a double inside page spread to exclusive interviews with retired French secret service agent Cabon in a small village in the Pyrenees foothills, described the death of Portuguese-born Dutch photographer Fernando Pereira in the bombing as a “cowardly assassination”. The editorial by editor Jonathan Milne said a past apology from France was “sullen and churlish”. “There is nothing honourable in the cowardly assassination, by combat divers in the dark of night, of a defenceless peace activist in a friendly nation.“Then, we might forget. “Every year at Anzac Day we make a promise to our heroes: We will remember them. “The terrorists who sunk the Rainbow Warrior are no heroes. It would be good to consign these men and women to the ignominy of mere footnotes in history. The Sunday Star-Times editorial also criticised NZ Prime Minister Bill English for refusing to comment on the revelations about Cabon, lest it “sour relations with France”. Christine Cabon, a French secret service (DGSE) undercover spy, infiltrated Greenpeace New Zealand as a 34-year-old volunteer by posing as environmental activist Frédérique Bonlieu.. Her assignment was to gather critical information and travel details about the planned protest voyage of the Rainbow Warrior to the French nuclear testing site of Moruroa Atoll, southwest of Tahiti, after the Greenpeace environmental flagship arrived in New Zealand from its humanitarian mission to Rongelap Atoll in the Marshall Islands during May 1985. In an investigation by Cecile Meier and Kelly Dennett, headlined “We are the terrorists”, Cabon, now 66, was revealed to be a town councillor – and former deputy mayor – of the small village of Lasseubetat (pop. 250) in the department of Pyrenees-Atlantiques, and highly thought of by the local community. 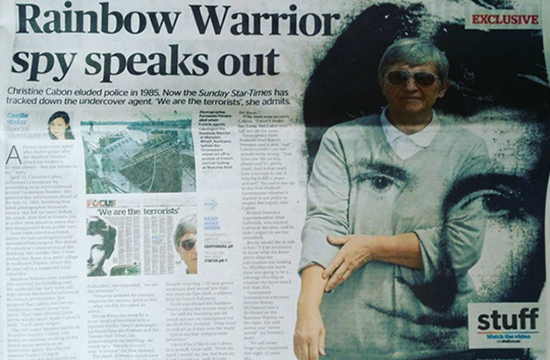 A Sunday Star-Times front page lead-in report headed “Rainbow Warrior spy speaks out” and bylined by Cecile Meier, said about the agent’s 32-year silence: “Though cagey at first, Cabon eventually provided details of her infiltration of Greenpeace. She stood by her subterfuge, saying military officers ‘can find themselves in situations they hadn’t wished for’. “Yet to New Zealanders, she conceded, “we are the terrorists”. The Sunday Star-Times commissioned interviews were part of a collaboration with La République des Pyrénées newspaper in France. Cabon left New Zealand six weeks before the bombing, initially travelling to Tahiti, Israel and then on to France — and vanished from public gaze. 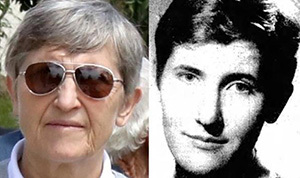 After her espionage cover was blown, she ended up on desk jobs in the French military and retired as a colonel when she was 58. She was decorated with the Legion d’Honneur, as were Dominique Prieur and Alan Mafart – the only agents of about 13 involved in the Rainbow Warrior bombing operation to be arrested (and jailed, albeit for a shorter term than their 10-year sentences). Both wrote books about their role in the saga. In September 2015, the saboteur who planted the bombs on the Rainbow Warrior, Colonel Jean-Luc Kister, publicly admitted his role and “apologised” on Television New Zealand. The Sunday Star-Times editorial said most New Zealanders did not remember the 1985 Rainbow Warrior bombing – “they were small children, or not even born”. “And they do not remember the perversity of the deal struck with the French government for this abhorrent piece of state-sponsored terrorism: a paltry $13 million compensation, an apology begrudgingly delivered in person years later, and the promise that the only two agents apprehended would serve just three years of their 7 to 10-year prison sentences on the tropical Hao Atoll, a “Club Med” style military base in French Polynesia. “They do not remember our own government agreeing to this limp slap on the wrist for France, fearful that if we protested it might imperil our lamb and dairy trade with the European Union. “Crime upon crime, indignity on indignity. Greenpeace New Zealand executive director Russel Norman told the Sunday Star-Times it was “sad” Cabon could not see her actions were wrong. Pacific Media Centre director Professor David Robie, author of a book about the Rainbow Warrior bombing and the Rongelap humanitarian mission, Eyes of Fire, said the Sunday Star-Times revelations again exposed the hypocrisy of the global “war on terror”. “This was an attack on a peaceful environmental ship by a friendly nation – state terrorism. And it included the shocking murder of a friend and colleague, Fernando Pereira, whose family never received real justice.